As you have gathered, this is an 11 September site, but deliberately not the typical thing widely seen on the Web. You will find recollections of the destruction and tears. However, 9/11: Pop Culture and Remembrance is as its title implies. It examines the history of 9-11 through the United States' popular culture of the time, and related artifacts. It is not a memorial site in the purest sense, but an historical one. As many aspects will be explored, including movies, music and the Internet. For the most part, the bounds of taste will be respected. 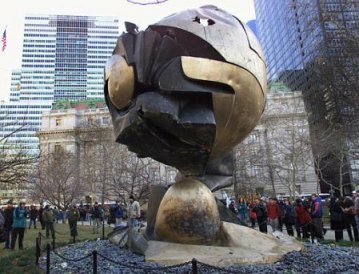 If anything on this site is crude, it is in the artifacts of 9-11 in the use of imagery and language. Sensationalism, such as showing bodies falling from the World Trade Center, will not be pursued. WHY THEY CALLED IT "A SECOND DAY OF INFAMY"
During the War of 1812, the British repeatedly attacked the US, culminating in the invasion of Washington, D.C., in August 1814. Troops burned the first White House and the Capitol building. A storm spared the rest of the the city. On Sunday, 7 December 1941, the Japanese Imperial Navy launched a sneak attack against the Pearl Harbor naval base in Hawaii. Nearly 2,500 men were killed. Until 11 September 2001, these were the only attacks actually within the United States. In addition, the enemies were clearly defined -- agents of sovereign nations. The 2001 terrorist attack is blamed on 19 men affiliated with al-Qaida (Arabic for "the base"), a loose network of terrorists with operating cells around the world. The network's accused leader is Osama Bin Laden, the son of a wealthy Saudi construction magnate who became a guerrilla fighter in his early 20s. These men represented no specific country, only an ideology. Western media have reported that ideology to be an extreme brand of Islam that hates the US and Israel and the former's interference in Middle East affairs and oppression of Muslims. In the wake of this delineated hatred are a damaged five-sided building, where crews now strive to completely repair by 11 September 2002. There is a remote stretch of land in southwestern Pennsylvania where memorials mark the crash site of United Airlines Flight 93. 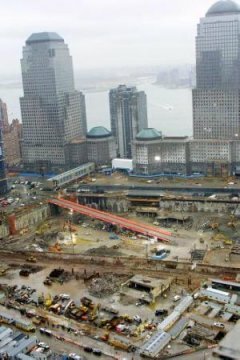 Still burned in people's minds as a great area of devastation, "Ground Zero" in Lower Manhattan now resembles an expansive construction site, something it truly will become in the next few years. The 16-acre parcel's name comes from the jargon for the epicenter of an atomic bomb's impact area. From September 2001 to 30 May 2002, firefighters, police and construction workers labored 24 hours a day to clear the debris, search for evidence, and respectfully remove the remains. Some 1.4 million tons of debris were to be sent to the Fresh Kills Landfill on nearby Staten Island. The materials were sifted to again inspect for criminal evidence and for remains that could help identify victims. The WTC steel took many paths. Some was sold to recyclers, some went to museums for preservation, some was subjected to investigations to determine why the towers fell, still more was set aside for the memorial on the complex's former site. On 30 May, a solemn ceremony officially marked the end of the recovery of human remains. 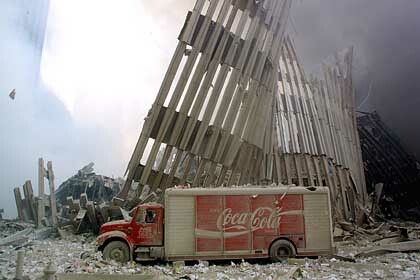 Cleanup continues in 2002. Also left by the perpetrators' hatred are the deaths of just over 3,000 persons. There are the survivors and families of these victims, who had to deal with pain, grief and fury at the attacks. Reports even surfaced that people who witnessed endless video replays of jets hitting the Twin Towers on CNN -- and knew none of the victims personally -- were feeling stressed and traumatized. There have been historic events with greater death tolls. But it is the drama and uniqueness of 11 September that have elevated it in contemporary American history. As previously noted, more than two centuries of US existence, there have been few acts of aggression within its borders. There is no denying that Americans don't live totally in a "bunker" mentality, as you might see in Israel. The USA is the last superpower on earth, and its culture is known worldwide and both revered and reviled. Major news events occurring in the US are heard around the globe. Americans also tend to be verbal and demonstrative when things happen to them. Thus, 9-11 is trumpeted and remembered with great passion. The United States has been insulated for decades from the hotspots of Europe and the South Pacific in World War II and on to Rwanda, Somalia, Bosnia and Herzegovina, and Israel and territories and Kosovo in the 1990s. When Americans were attacked and killed, it might have been in the capital of Somalia or a port in Yemen, but not downtown New York City! The resemblance of 11 September to some summertime blockbuster was not lost on citizens, either. Witnesses within the entertainment-saturated culture looked upon the burning structures and the jet crashes and repeatedly said "It looked like a movie..."
The bizarre thing was, in the decade leading to 9-11, disaster had visited New York City and Washington in the form of aliens, meteorites, a giant mutant reptile and yes, terrorists. Most of the time, filmmakers trashing the Big Apple fixated upon the Chrysler Building's destruction, and not the World Trade Center. The adults who passed through 9-11 know the "non-fiction movie's" ending: the Art Deco jewel named after Walter P. Chrysler still rises above Manhattan, while the once mundane WTC suddenly became a treasured memory and site of heroism. Citizens were shaken when they learned that the terrorists may have intended to fly a jet into the White House, which would have been the real-life counterpart to the aliens' demolition in Independence Day (1996). People cried, raged, sang and remembered. This occurred not only among the survivors, but those who only witnessed 9-11 on TV and did not know any victims personally. They lit candles, attended rallies, held little flags, pinned on red, white and blue ribbons and sang patriotic tunes. Pop stars and actors held fund-raisers that generated millions for victims' families. Maudlin songs were dug up and played on the radio, and new ones were written as a tribute to heroes and victims. Web sites were posted, graphics created and Flash movies set to sad songs were crafted. Americans felt, briefly, a sense of national community. Old Glory was everywhere -- vehicles, houses, office buildings -- as cloth flags, stickers, T-shirts, bandanas, hats -- wherever it was possible. "God bless America!" "United We Stand!" 9-11 gained its slogans, its lingo ("Ground Zero") and its cultural references. Remembrance of 11 September ranged from the teary to the profane and furious. The US next went to war, dropping bombs on Afghanistan about a month after the attacks. George W. Bush, previously mocked as clueless and even a bit stupid, saw an image shift to strong wartime president and decisive leader with high approval ratings. A domestic terrorist further set people on edge by mailing letters laced with the anthrax bacterium to Congress, NBC News and The New York Times. 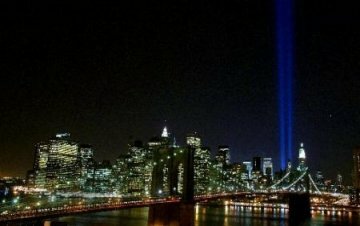 These are the themes of this site, 9/11: Pop Culture and Remembrance -- the social aspects and impacts, as well as the popular culture that grew out of the tragic incidents. These things are documented as factually and dispassionately possible. This is intended to be an historic site that analyzes a nation after it existence was rocked, and lives were changed. Historians inevitably will mark 9-11 as a flashpoint in early 21st century US history in future texts. One month it was hot rod races (The Fast and the Furious) or more CGI dinosaurs (Jurassic Park III) at the multiplex, and eternal stories about vicious sharks and California Congressman Gary Condit and his missing intern, Chandra Levy (whose remains ultimately were found in a Washington park in May 2002). In the next it was shattered concrete and shattered lives and talk of war. A rush of battles and names like "Tora Bora" "Mazar al-Sharif" and "Taliban." The "Office of Homeland Security," anthrax attacks and National Guardsmen patrolling airports. This is the legacy and societal impact of one date in the first year of the 21st century.